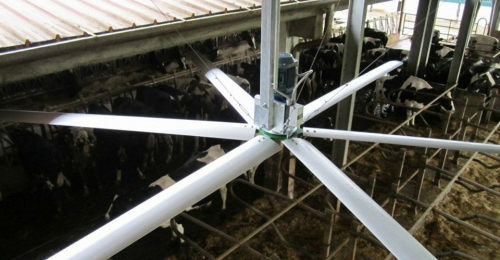 These fans are designed to maintain optimum air temperature and humidity in livestock buildings. Available for immediate delivery across the UK. Good building ventilation is vital to maintaining healthy, productive animals; reducing infections, respiratory problems, heat stress and flies. Our fans will enhance the natural ventilation of your barn, bringing in fresh air and increasing evaporation from both cows and bedding to reduce temperature, humidity and flies. We supply two ranges of fans in different sizes, and a control unit to optimise the temperature, humidity and air speed in the building to maximise animal comfort. Designed to keep air circulating in large, open spaces these high volume, low speed (HVLS) ceiling fans have a hot-dipped galvanised steel support frame and aluminium blades making them strong and robust without being heavy. CE Certified for safety. The blades are fitted directly onto the gearbox with a security system that prevents their release. Ideal for smaller spaces such as parlours or calf housing, these fans will provide a constant airflow through your building to keep your cows cool and dry and the air fresh. Designed specifically for safety and durability in livestock barns. You can buy small numbers of these fans from our online shop for delivery within 2-3 days. For larger or more complicated orders please give us a ring for advice and a quote. The fans come complete with installation kits for you to install them yourself, but we can install them for you if you prefer. They need a three-phase power supply, we can supply the necessary invertors if required.